G327.1-1.1 is a supernova remnant of about 211 light years-across, located in our Milky Way galaxy, some 29,000 light-years away in the small southern constellation of Norma. The age of the remnant is estimated to be about 18,000 years. A supernova occurs when a star explodes in the final phase of its life. The exploding star can become billions of times as bright as the Sun before gradually fading from view. At its maximum brightness, the exploded star may outshine an entire galaxy. After some supernova explosions, when a star collapses and becomes so dense that protons and electrons squish together to form neutrons, there remains a small, ultra-dense neutron star. Rapidly rotating, highly magnetized neutron stars are called pulsars. (After other supernova explosions, a black hole may be left behind.) The explosion throws a large, roughly spherical cloud of dust and hot gas into space surrounding the neutron star (or black hole). When this slams into the existing interstellar medium, it heats up so much it glows in X-rays. Supernova explosions are enriching the intergalactic gas with elements like oxygen, iron, and silicon that will be incorporated into new generations of stars and planets. 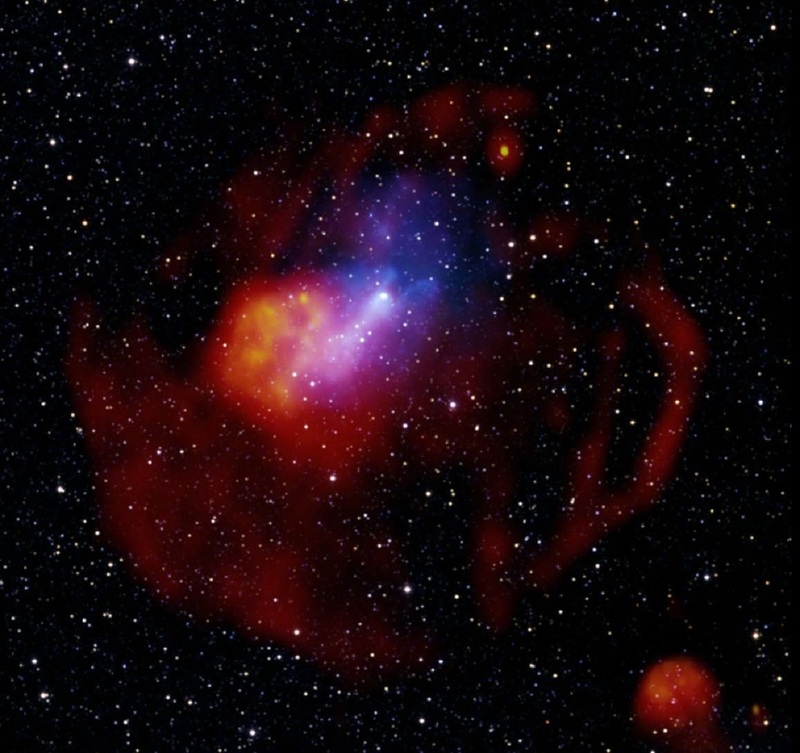 In G327.1-1.1 a pulsar (the white dot in the blue area) was left behind after the explosion and is producing a wind of relativistic particles, seen in X-rays (blue) as well as in the radio data (red and yellow). This structure is called a pulsar wind nebula (known as PWN G327.15-1.04). The large red circular feature is produced by radio emission from the blast wave. No clear explanation is yet known for the unusual shape of this supernova remnant, including the off-center position of the pulsar wind nebula and the comet-like shape of the X-ray emission. One possibility is that we are seeing the effects of a shock wave bouncing backwards off of the shell of material swept up by the blast wave. The pulsar is moving upwards, away from the center of the explosion, but the pulsar wind nebula is being swept towards the bottom-left of the image by the reverse shock wave that is also traveling towards the bottom-left. In this composite image X-rays from Chandra & XMM-Newton were combined with radio data and infrared data. X-rays are shown in blue, radio in red and yellow, and the infrared shows the stars in the field.